Tarzan is back. The former Deputy Prime Minister, who became known as the Minister for Merseyside after his role in trying to rebuild Liverpool after the Toxteth riots of the early 1980s, will run a task force looking at the problems of the inner cities. Lord Heseltine's appointment is a strange one. His urban regeneration schemes have always been controversial. The expensive redevelopment of areas like London's Docklands and the Cardiff Bay area are reasonably positive testimony to his legacy but other expensive schemes left little behind. The Liverpool Garden Festival, for example, left a derelict site. 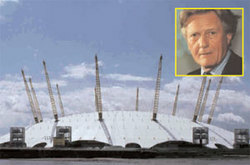 Lord Heseltine's last major regeneration project in government was the spadework for the Millennium Dome. Lord Heseltine is also an instinctive centraliser. His Development Corporations were controversial in the 1980s and 1990s because they bypassed local government and focused on large physical regeneration projects, rather than the human infrastructure. There were widespread complaints that buildings were rebuilt - often leading to gentrification - but an area's underlying problems of family breakdown, welfare dependency and poor schools were left untouched. There is an obvious overlap with two existing policy groups. John Gummer's quality of life group had been charged with looking at the built environment and Iain Duncan Smith's social justice group has a remit for reviving Britain's poorest neighbourhoods. Interviewed about his role on this morning's Today programme, Lord Heseltine was unconcerned about policy group overlap. "Let a thousand flowers bloom," he said, and see which of the policy groups produce the best ideas. He also said that his new role would not stop him from criticising David Cameron's policies. He noted his opposition to the Tory leader's planned exit from the EPP and he still had hopes that it would not happen. Whatever an opposition party promises, he continued, the reality is that governments have to work very closely with like-minded parties in the EU. A truly great man indeed. I agree Frank - the work he did in Liverpool in response to the riots was one of the Party's finest moments and I have to say Norman Tebbit's 'get on your bike' speech, which was a response to Heseltine and the problems in Liverpool, one I personally find pretty disgraceful. Heseltine? Gummer? Aren't these the people that voters were sick of in 1997? By their fruits shall ye know them - there's less and less doubt that Cameron is a trendy lefty and more and more certainty that legions of traditional Tories won't stir their stumps to vote for him when the time comes. I'm not one of those who would ever be stupid enough to call Cameron a 'trendy lefty'but I do wonder at bringing Heseltine back. Heseltines ambivalent attitude toward our party in recent years does him no credit and his inner city initatives of the 1980's were almost entirely cosmetic. I can see why Cameron might think this was a good idea (healing the wounds etc)but think that this time he might come to regret his decision. Policy Group Chairman - Heseltine, Clarke, Gummer - the Wets are back! Policy Group Chairmen - Heseltine, Clarke, Gummer - the Wets are back! What next - clones of Heath and MacMillan? I'd hardly call Heseltine's attitude to the party ambivalent. He has remained active within the Tory Reform Group, of which he is Vice-President and President of the Patron's Club. I do feel if Tebbit is allowed to have his say on matters Conservative it's only fair Heseltine has a say too. I have to say Norman Tebbit's 'get on your bike' speech, which was a response to Heseltine and the problems in Liverpool, one I personally find pretty disgraceful. It was a reaction to the claim that the riots were caused by unemployment - a claim that undoubtedly false when applied the riots of the early 80s, where the trigger was almost always police treatment of the local black communities. I think Tebbit's response wa sa perfectly reasonable one to those who tried to blame government policy for lawlessness. "I agree Frank - the work he did in Liverpool in response to the riots was one of the Party's finest moments and I have to say Norman Tebbit's 'get on your bike' speech, which was a response to Heseltine and the problems in Liverpool, one I personally find pretty disgraceful." I think the point Tebbit was making was that there was no excuse for the riots. The 1930s (when his father got on his bike) were a time of great hardship but those who were distressed had the decency to go on marches rather than smash up the areas where they lived. While I am not a fan of Michael Heseltine and admit to knowing little about his involvement with Liverpoool, the bits of info I've just read on Google are very positive. His unfortunate pro-European stance should not distract from his genuinely beneficial work in this area. "I do feel if Tebbit is allowed to have his say on matters Conservative it's only fair Heseltine has a say too." When Tebbit is put in charge of a policy group, then you might just have a valid comparison. Until then this is another example of Cameron's reheating of Majorism. All we need is Chris Patten to complete the set. "When Tebbit is put in charge of a policy group, then you might just have a valid comparison. Until then this is another example of Cameron's reheating of Majorism." I agree, John Redwood would have been a better example to cite than Norman Tebbit. James and Richard - I wasn't trying to say Tebbit told the Liverpool rioters to get on their bike and look for work - what was disgarceful was Tebbit's speech at Tory Conference in response to Heseltine's speech the day before. Tebbit used his speech to slap down a compassionate, thoughtful, moving speech from Heseltine, where he spoke for those in Liverpool (not the rioters) who were suffering genuine hardship and social exclusion. The fact is, Heseltine was the man who got on his bike, went to Liverpool, listened and achieved a lot - the fruits of which can be seen today. The policy groups are advisory. Seeking advice from people who have actually done the jobs in government that Cameron is now seeking to do seems entirely sensible -- and naturally, many of those people with government experience will be veterans of the Major government. If useful roles for two vastly experience politicians such as Patten and Tebbit can be found, so much the better. 'Heseltine hasn't been ambivalent' -Frank Young. I think publicly questioning whether he would vote Conservative at all at a general election sounds pretty ambivalent to me Frank! The problem is that these policitians are vastly experienced but rather less successful. Heseltine's attempts at urban regeneration created little more than a series of costly vanity projects. I don't think we actually need a "White Elephant" policy group. Michael, apart from the Garden Festival, I don't remember what Michael Heseltine did achieve in Liverpool. At the time, I felt that there were awkward analogies between Tarzan helicoptering into Merseyside and the future Edward VIII visiting the Welsh Valleys during the Depression. He may well have empathised with the unemployed but what good was that when he was one of the biggest supporters of membership of the ERM, along with Ken Clarke? Most of my family are Liverpudlian and my generation (the one that grew up in the seventies and eighties) did exactly what Tebbit suggested.....which was the obvious thing to do anyway. Most left Merseyside in search of work as have many other Liverpudlians. I like Liverpool as a place but let's not pretend that the prestige projects of politicians can easily reverse the steady decline of Liverpool as a city since about 1918. "The expensive redevelopment of areas like London's Docklands and the Cardiff Bay area are reasonably positive testimony to his legacy... His Development Corporations were controversial in the 1980s and 1990s because they bypassed local government and focused on large physical regeneration projects, rather than the human infrastructure. There were widespread complaints that buildings were rebuilt - often leading to gentrification - but an area's underlying problems of family breakdown, welfare dependency and poor schools were left untouched." Yes, developments such as London Docklands, Liverpool Albert Dock, Manchester Salford Quays and Cardiff Bay are superficially positive (short-term and medium-term job creation; 'cleaning up' of a problem area; attraction of wealthy, young middle class types etc) but as you quite rightly allude to, these are only skin-deep regeneration schemes and amount to little more than the yuppification of previously working-class areas. The trouble with these schemes is that they hinder genuine urban regeneration by serving to displace social deprivation to other areas whilst simultaneously leeching investment from those other areas. Real urban generation requires investing in better schools, cleaner hospitals, effective policing, affordable quality housing and long-term job creation, not just subsidising luxury penthouse apartments, chic fashion boutiques and trendy wine bars, and if Michael Heseltine and David Cameron demonstrate that they have the ideas and policies to address this issue, then I'll back them all the way. "The fact is, Heseltine was the man who got on his bike, went to Liverpool, listened and achieved a lot - the fruits of which can be seen today"
Have you ever seen Everton? My assumption with some of these appointments was that it was part of DCs healing process - putting back together a fractured party. This brings back into the big tent some of the more detached of our experienced leadership but it a less public role than a frontbench job. My concern with Heseltine is that he seems to be from what I think of as the neoBarcelona school of urban re-generation. The Barcelona Olympics developments did play a part in the re-generation of that city - in providing better transport, clean up of a run down area. But it was part of a much longer term activity and very bound up anyway with Spanish growth from EU membership. Just doing the one big project and expecting that to seed an ongoing regeneration isn't enough. As DVA says its about wider regeneration - redeveloping old housing not knocking it down and replacing wih high density boxes, working at the local level in building better schools, improving policing and supporting local retail businesses (look how few shops can operate in high crime areas). It's about working with organisations like the Prince's Trust to stimulate local small businesses. Most of all its about a long term committment - not a short term project. As a Liverpudlian, one of the most tangible achievements of Heseltine was the tree-planting scheme. If you look at the city from the top of the cathedral it is a surprisingly green city. We got ahead of the game with that - Manchester is playing catch-up now with a far more expensive project. Ludicrous! Heseltine, Clarke et al were responsible for the "second round" of mass unemployment with their support for the job destroying shadowing the DM, and the ERM. It's like putting a burglar in charge of clearing up the home he has just trashed (and paying a fee of course). He is also infamous for the racist "joke" he told about Toxteth youths. Change is a great rallying cry but more and more it looks like going back to the failed elite which caused all our problems in the first place. The real change we need is to kick them out. "Change is a great rallying cry but more and more it looks like going back to the failed elite which caused all our problems in the first place. The real change we need is to kick them out." Steady on. I am the last person to pretend the Major government was perfect, but let's not forget that (the Sun notwithstanding) John Major was the last Conservative leader to win an election (although I admit he was ably assisted by Neil Kinnock!) so his lot can't have been that bad. Im going to do something I dont do very often, Im going to hold back my views until I see a bit more detail. This is because Thanet is one of the areas specifically affected by this. Its very likely that I will have to move into the worst area in Thanet (Cliftonville) and I would like to see what is planned for areas like this one. Cliftonville (also known as "Kosoville") is one of the most deprived parts of Kent, if not the South East. Its a crime hotspot, very high unemployment, housing problems caused by the past prevalence of HMOs. Cliftonville also suffers from the problem of children in care, where they are shuttled down here from other counties (yes, against Government guidance and common sense) and end up just hovering about with no real sense of direction. So for now, at least till Ive seen the speech, I'll keep stuhm. Editor - is there an entry for gerontocracy in your Dictionary? So Tarzan planted trees. Big deal! What about his behaviour towards Thatcher? Remember Westland and his leadership challenge. He cannot be trusted. The Major government wasn't Major's. It was effectively a joint premierhip of Clarke and Heseltine, with Major as he figurehead at the front. This was the government that lead our party to it's worst ever defeat in 1997 - yes he won in 1992, but that was (as pointed out above) against Kinnock. In view of this, one must question the wisdom of bringing this man back into the frontline. What next? Millenium Dome 2? Clarke in charge of democracy, Hezza in charge of regeneration. Say goodbye to localism and hello centralising big government. I would love to know what Dan Hannan thinks of his Boy Wonder now. Daniel, Daniel, Daniel, Salford Quays is not in Manchester! It's also a fine model for bringing jobs, redevelopment and culture back into the inner-city. However, it didn't go nearly far enough. The Ordsall estate (right next door) remained largely untouched. "Daniel, Daniel, Daniel, Salford Quays is not in Manchester!" "However, it didn't go nearly far enough. The Ordsall estate (right next door) remained largely untouched." This is the point I was making - the wider community tends not to benefit from these schemes. Butetown in Cardiff is another example - money is pouring into the Cardiff Bay development scheme, whilst the main Butetown community remains a ghetto beset by social deprivation and exclusion. "What about his behaviour towards Thatcher? Remember Westland and his leadership challenge. He cannot be trusted"
How many years does it take until people just get over it!! I was a teacher in inner-city Birmingham schools. The Major government, ably supported by Hezza and Cuddly Ken, decimated jobs in the areas the pupils' parents lived. 30% unemployment was their legacy. I don't know if anyone can really understand what such high levels of unemployment do to a community. I stand by my contention that change=getting rid of past failures. Kick them out! Mid Night Blue...for some of us the answer is NEVER. This is the point I was making - the wider community tends not to benefit from these schemes. Butetown in Cardiff is another example - money is pouring into the Cardiff Bay development scheme, whilst the main Butetown community remains a ghetto beset by social deprivation and exclusion. "I quite agree - but the problem is not with developments like the Quays but the fact they could have gone even further..."
Well I bow to your local knowledge regarding Salford Quays, and I acknowledge that such development schemes do have their benefits, but I still believe that these schemes do little to address the needs and concerns of the wider community. So many of your correspondents are harking back. And, of course, some of them might not have accurate recall, but few of us could tell after all this time. The message for today is look forward with great optimism, back the Leader and his appointees and get stuck into supporting the Conservative cause and so ensure the Party does well at the forthcoming local elections and the general election whenever it comes. No more griping, please. Being raised told that Heseltine was Judas makes it pretty hard for me to approve of his appointment, I have never really liked the guy, and to be honest I cant really see the point for this policy group, it all seems to fall under the Social Justice group to me. I am all for this appointment. It keeps Heseltine onside and gives him something to do. Congratulations to him for taking it on at his age. He should concentrate on planting more trees rather than building new Domes, and might profitably start by attending to the Prince of Wales' views on how to create a civilised and inspirational urban environment. Has a European Policy Review been formed yet ? If not, I am sure Emma Nicholson or Hugh Dyke might be available to chair one. Not learning the lessons of the past dooms a party, and more importantly our country. Many people have suffered because of failed politicians. Blair isn't the only one to have damaged this country. Salford Quays brought investment, jobs and (subsequently) transport infrastructure into an area that had been struggling for several decades. That investment needs to go hand-in-hand with improvements in education and housing in the vicinity. This stuff about young Heseltine is an excellent piece of news. Exactly the fresh new blood the Party needs to go out there and knock spots off Mr Attlee and his counter-jumping Bolshies. I have certainly not forgotten Heseltine's responsibility for the fall of Margaret Thatcher, which the party has still not fully recovered from. But I can forgive. Heseltine cheerfully poured scorn on the last 3 party leaders whenever the BBC gave him a chance so this appointment is in my view a small price to pay for keeping him quiet. "Whatever they say in opposition and this may sound like distancing myself, the reality of politics today for any Government is that you have to get on with your European colleagues there is a team there, they are important to you, they are making decisions you're either on the team or you are not, and if you are not on the team you are selling out British interests. David Cameron will never do that. So in reality the new Conservative Government, when it is formed, will do what every Conservative Government has done since the 1960s and that is to pursue a broadly pro European policy". In that case the Tories will be rightfully punished by the electorate. Being on the team didn't stop the disaster that was CAP or compulsory metrification. Chris Patten will chair European Policy Group with Jacques Delors acting as a consultant. Gerry Adams to run Ulster task force. Kate Moss and Pete Doherty to advise Dave on drugs policy. Graham Norton and Julian Clary to lead Family Policy Group. Francis Maude to give the Ted Heath Memorial Lecture at Party Conference. Shaun Woodward to look after Hezza's arboretum whilst he is planting another in Liverpool. I think that is an excellent idea that Michael Heseltine is in charge of this task force. The wets are not back in charge, but I see a very very fine balance for the task forces. John Redwood, Iain Duncan Smith, Peter Lilley. It shows a united front! A united front of Cameron supporters or yesterday's men? I have been trying so very hard to be loyal to DC as leader, but this is like the Chinese Water Torture. Each drip makes it more and more difficult to stand firm before one is forced to scream out in agony for mercy and release. I mean, Heseltine? Can't we find anyone better than this disloyal, treacherous backstabbing turncoat with his regressive ideas and his big-government thinking? Is this really the best we can do as a party? Can't we find one single more credible person than him in the entire Party to front this? Why don't we nominate some existing or ex-MP's to the CH Goldlist forum and see how they would fare for us as potential A-List candidates? DC needs to get on board the local community activists - like the guy on the daily politics show today. These are the people who should be consulted and listened to and their advice acted upon. There is a massive feeling of betrayal by the Labour Party and this is where DC should be proving the point on change by listening. As someone who comes from Merseyside and worked in several youth projects in Liverpool 8 (Toxteth) and other areas in the late 70/80's I experienced at first hand the Tarzan effect and the lasting damage it did to the Conservative Party and its image in Liverpool. We, and especially Hezza in some areas are still considered a joke. The image is still alive of Tarzan swinging down from his branch making a lot of noise, taking a coach load of posh businessmen on a tour of the city, without ever getting out and creating a garden centre that went into liquidation and in debt within 2 years. It is still seen as a massive political gesture without any real substance. It was seen as short termist and not dealing with the real underlining problems. It was seen as coming in making a big splash but doing nothing. Where was Hezza and the Conservatives when Derek Hatton was running Liverpool into the ground - still up in his tree but conspicuous by his silence and inactivity. While I am a big fan of DC I think he could be making a big mistake in sending Hezza back to Liverpool. Nobody there is going to take him seriously. His credability is zilch. It is still too soon his image there is still of a stuffed shirted toff who lives in a mansion and who cannot in a thousand years understand the ordinary people and their problems. He is totally the wrong person to send on behalf of the Conservative Party to Liverpool. We cannot afford another urban disaster.